A kind of 'Transformers' game, the sort where robotic warriors fight it out across an unsuspecting landscape... and have you ever wondered just why of the whole planet, the evil invading robots always choose to land in a sleepy township that's crawling with robots who are delighted to have the opportunity to beat them off? Unlikely you'll find the answer to that question playing this game, but you will have a good punch up! Weave the action into another ongoing campaign or use it for a one-off when you fancy a brawl. 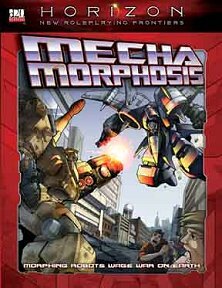 Publisher's blurb: "Fantasy Flight continues the Horizon line with Mechamorphosis, a world of devastatingly powerful robotic warriors that hide among us as cars, jets, and everyday objects. Some are terrorist aggressors, enacting evil schemes to dominate human kind. Others are self-declared defenders of the human race, fighting their mechanical foes and avoiding the military forces of the fearful and desperate people they are trying to protect. Their battles rage from hidden desert bases to active volcanoes, from the depths of the sea to the frontiers of space. In Mechamorphosis, the warrior doesn?t pilot the robot; the warrior is the robot." Click HERE if you want to buy this book from Amazon.com or HERE if you prefer to use Amazon UK.